Brig. 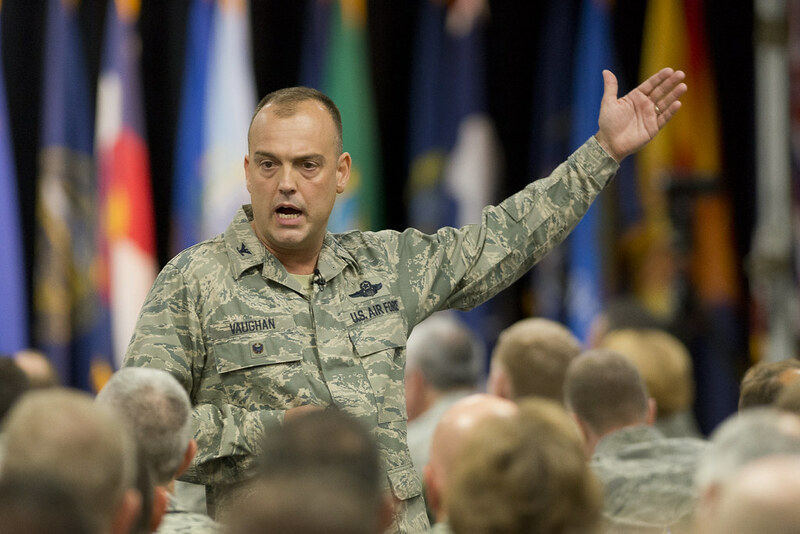 Gen. Edward L. Vaughan is the Air National Guard Special Assistant to Maj. Gen. Scott F. Smith, the Director of Training and Readiness, Deputy Chief of Staff for Operations, Headquarters U.S. Air Force, Arlington, Va. 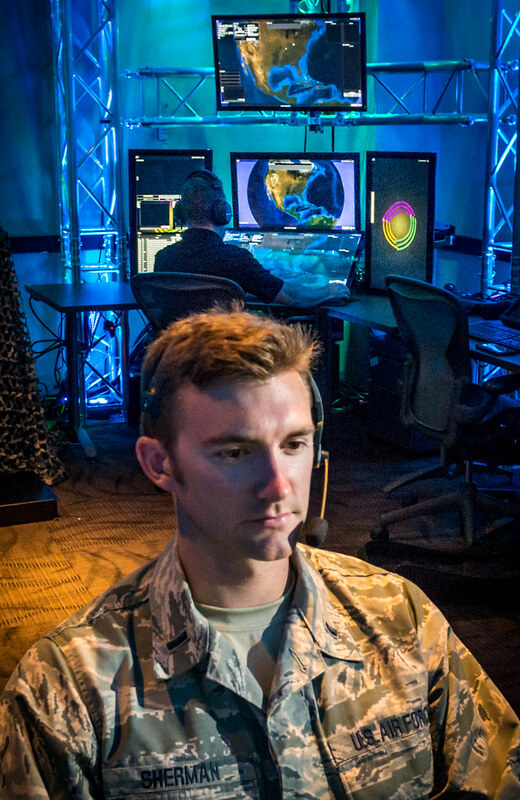 The directorate, encompassing seven divisions and the Air Force Agency for Modeling and Simulation, is responsible for policy, guidance and oversight of Air Force operations. General Vaughan also serves as the lead for the Air Force Physiological Episodes Action Team (AF-PEAT) and co-leads the ad hoc Joint-PEAT, along with Navy Rear Adm. Fredrick R. Luchtman. The Air Force and Navy announce their Joint Physiological Episodes Action Team, or J-PEAT, Sept. 11 at the Pentagon, Arlington. 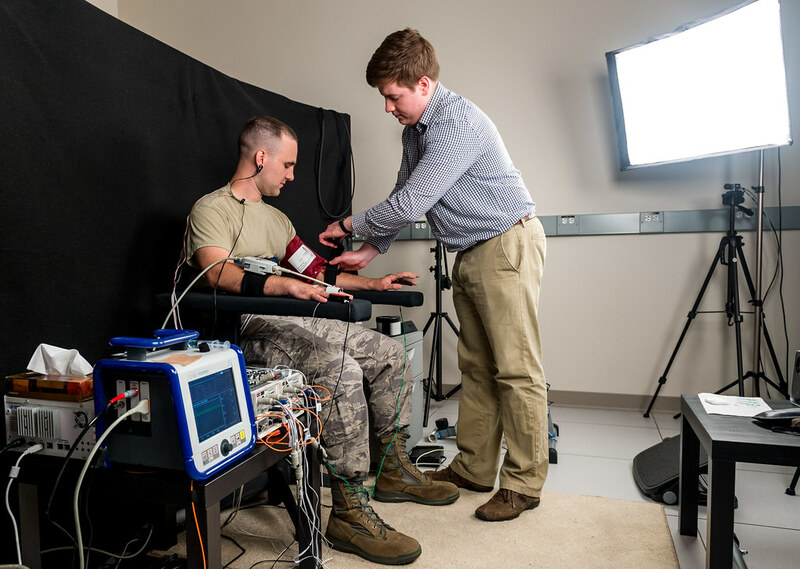 In a collaborative effort of Force Integration, the Air Force will also rename their Unexplained Physiological Events Integration Team to the AF-PEAT. General Vaughan completed Reserve Officer Training Corps at Rensselaer Polytechnic Institute and received his commission as honor graduate from ANG’s Academy of Military Science. 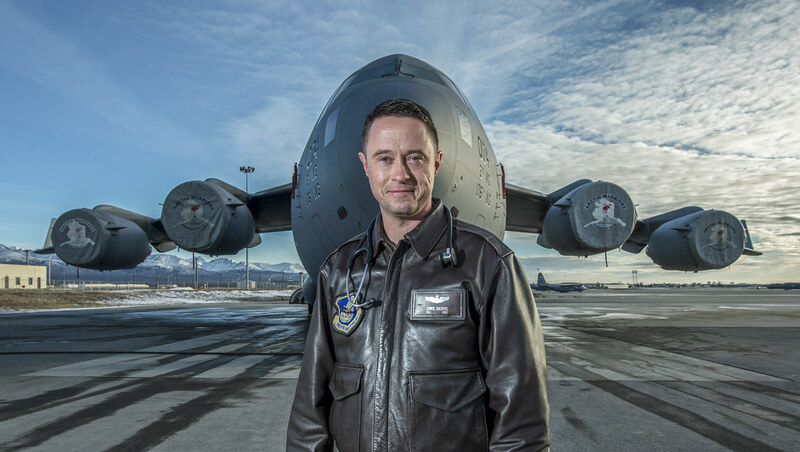 He previously served in leadership roles at the squadron, group, wing and higher headquarters levels in both the mobility and combat air forces. 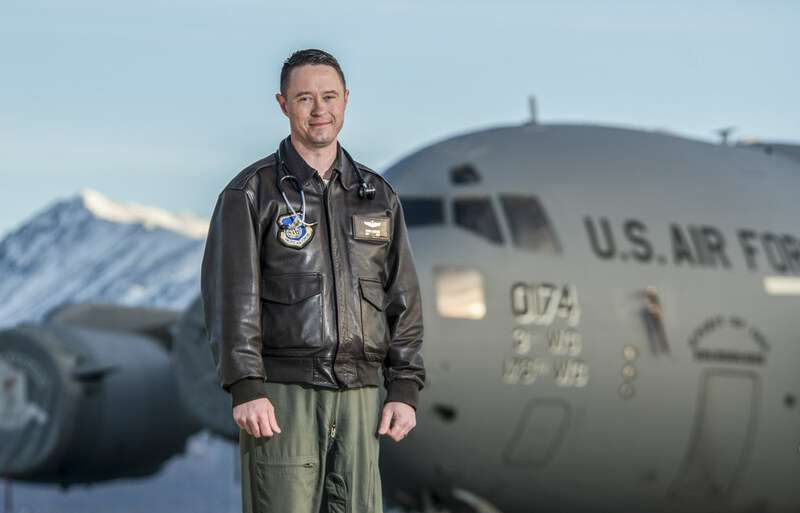 General Vaughan commanded the 156th Airlift Wing, Puerto Rico, and Detachment 1 of the 13th Air Expeditionary Group (formerly the 13th Expeditionary Support Squadron), Antarctica. During an interview with Airman magazine, Gen. Vaughan discussed his new post leading the joint investigation of Unexplained Physiological Episodes (UPEs) and his experiences as a mobility and combat Airman and safety officer. 1. What is the PEAT? Airman Magazine: Please tell us about your new job investigating Unexplained Physiological Episodes. Brig. Gen. Vaughan: As part of my role working in A3T, I’ve been tasked by the A3 Lt. Gen. Mark Kelly to lead the Physiological Episodes Action Team, also known as the PEAT. PE stands for physiological episode or event. Essentially it’s any anomaly in the interaction among the aircrew, equipment, and environment that causes adverse physical or cognitive symptoms, which may impede the ability to fly..
What we’ve done across the Air Force and all aircraft, but most recently with the T-6 fleet, is to investigate what causes PEs. In some cases an Unknown PE will immediately reveal to us what happened. Maybe there was some sort of contamination in the cockpit due to an oil leak or some other fumes, so we’re able to identify it as a known physiological event. In other cases, pilots will experience symptoms, come down and land, report them and we don’t know exactly what the cause is until we investigate further. 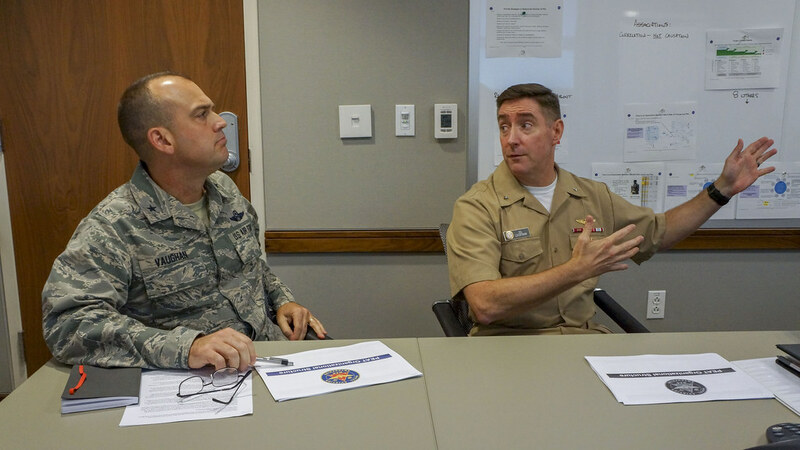 Members of the Navy Physiological Episodes Action Team and Air Force PEAT listen to a discussion between Rear Adm. Fredrick R. “Lucky” Luchtman (left) and Air Force Brig. Gen. Edward L. “Hertz” Vaughan (right) as they lay the ground work for the Joint Physiological Episodes Action Team, or J-PEAT. Airman Magazine: Tell me about the PEAT. What is the structure and objective of the team? Brig. Gen. Vaughan: The AF-PEAT is Air Force Physiological Episodes Action Team. Now, previously this has been known as the UPE IT or Unexplained Physiological Events Integration Team. We’re working very closely with our Navy partners and they came up with a pretty good name – Physiological Episodes Action Team. In the interest of both jointness and keeping it simple for all the flying community, we’ve aligned names with the Navy. Of course, that’s not the only thing we’ve learned from the Navy. The Navy’s had some great success in exploring what happens in physiological episodes, what happens to aviators, and we’ve been able to learn a lot from them and they’ve learned from us as well. Airman Magazine: How does the PEAT operate? Brig. Gen. Vaughan: We have two meetings per week. Every Friday the Air Force PEAT meets. Who is on this action team? The answer is those people who are required for that particular meeting. We’ll have the topics of the week, sometimes we’re looking at specific incidents with airplanes, specific episodes, and other times we may be investigating new equipment that’s coming out, new procedures, new training or maybe there’s the results of an investigation that we’ll need to review. We have standing members of the team, about half a dozen, that are there at every meeting. Then we have another kind of a second layer of folks, which gets us up closer to 20 people, who come in as needed. That second layer includes folks from the acquisition community or the 711th Human Performance Wing. We don’t necessarily need to have them come to every meeting, but there’s times we really need somebody from human performance wing present. That’s one meeting. Then immediately following that meeting, we have, what I call the Joint-PEAT. It’s really an ad hoc Joint Physiological Episodes Action Team with the Navy. It is very much a joint effort in that we work closely together and meet weekly to keep a steady battle rhythm so as things come up during the week, if they’re not an emergency or if it’s not something that we’ve got to address right at that minute, we’ll be able to put it together on Friday. We know that once a week we’re going to have a meeting where we can sit down face-to-face and hash these things out. My Navy counterpart is Rear Adm. Frederick Luckman, he goes by “Lucky”. My call sign is “Hertz”. We immediately got to a Hertz-Lucky professional friendly demeanor. We go through an awful lot of coffee. He and I meet as often as we can to share data. Like I said, we cannot share the information fast enough. The Navy is doing a lot of good work. They had a series of issues with physiology not only in the F-18, but T-45s, and they’ve had very good success in their T-6 fleet. They have a T-6 fleet that’s about half the size of the Air Force’s. They have slightly different models, some of theirs are newer models, but the oxygen systems are very similar. 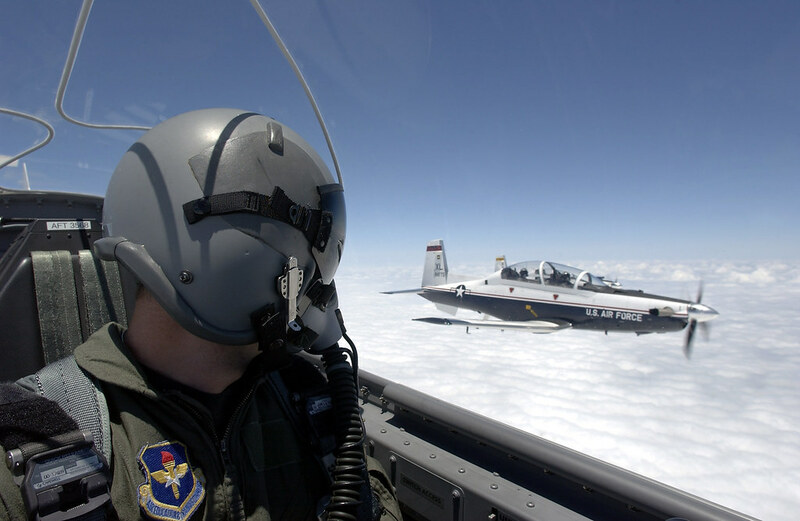 The Navy adopted early on, in response to some of the lessons they learned from other airframes, significant maintenance practices in their T-6 oxygen system that we found very useful. We watched the Navy adopt those, saw the results of it and in those cases we’ve been able to adopt it exactly the same way that they have. Airman Magazine: How does the timely resolution of PEs, affect training and readiness? Brig. Gen. Vaughan: Looking at the National Defense Strategy, lethality is the primary objective and, for the Air Force, that equates to readiness. Are we ready to fight? You know, the question is readiness for what? Ready to do what? It’s ready to prosecute the war, ready to fight. In some cases, being ready to go out and influence and be that presence where we need to be. If we’re having equipment struggles, delays in our programs, or we’re having to stand-down aircraft or cancel missions because of physiological episodes that will get in the way of us being ready. It will get in the way of us executing any plans we may have out there. So it’s important for us to get the information back, put the fixes in, get those funded, fielded and executed as quickly as possible. Once we do that, we’re going to enhance readiness and capability as we grow toward the Air Force We Need. It also eliminates a distraction. Anytime you have aircraft mishaps of any kind, anytime you have a cluster of these PEs, it’s going to create a distraction, not just for the frontline Airman, but for their families, and anybody else associated with it. Anybody involved with the operation and maintenance will have a distraction. That distraction takes our eye off the readiness ball. That’s one of the reasons that you’ll see the PEAT, Physiological Episodes Acting Team, embedded right in A3T. A3T’s tasking is training and readiness. 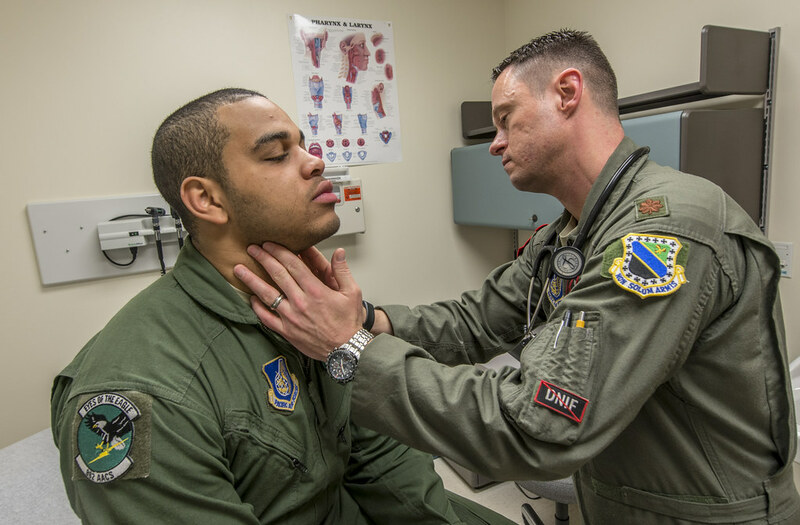 Airman Magazine: What types of symptoms are commonly associated with PEs? Brig. Gen. Vaughan: Symptoms span the spectrum of what can happen to people on airplanes. I’ll caveat this with Air Force aviators receive extensive training in physiology and what may happen to them in tactical aviation. All pilots and other aircrew going through their initial training, experience the hypobaric chamber, we call it the altitude chamber. They get used to what it’s like to operate at high altitudes and what happens during decompression. They also have routine refresher training in all aspects of aviation physiology. One of the main reasons for doing that training is so that each aviator can learn what their individual symptoms will be. No two people will react the same to an aircraft or environmental stimulus and, in fact, the same person may have different reactions on different days based on fatigue, fitness, nutrition, or other personal factors. It’s important for each aviator to have a sense of what symptoms they might have, especially the early onset symptoms, so they can take early appropriate action to safely recover the aircraft or get out of the environment that’s causing the problem. Some of these symptoms can range from things like tingling in the extremities, fingers and toes, headaches or nausea. There are actually cases of folks having euphoria, while other folks may become belligerent. They know if you’re flying along and all of a sudden you just feel a little irritated for no particular reason it may be time to check your oxygen system, look at the environment you’re in or determine if that’s caused by something else. Then take appropriate action to mitigate the risk. Airman Magazine: You have said that when investigating and mitigating PEs, “We can’t share information fast enough.” Describe what you mean and how that process can be improved? Brig. Gen. Vaughan: Sharing the right information and then making sense of the information is very important in dealing with this phenomenon. What we do right now in the Air Force is we listen to the pilots. Pilots will land and give us a debrief – What happened? When did it happen? What types of conditions were going on in the airplane? You’ll find that in the Air Force fleet, and the Navy fleet as well, most of the aircraft have pretty sophisticated sensors when it comes to their engines and other aircraft systems. When they land that information is downloaded, aggregated, and acted upon. 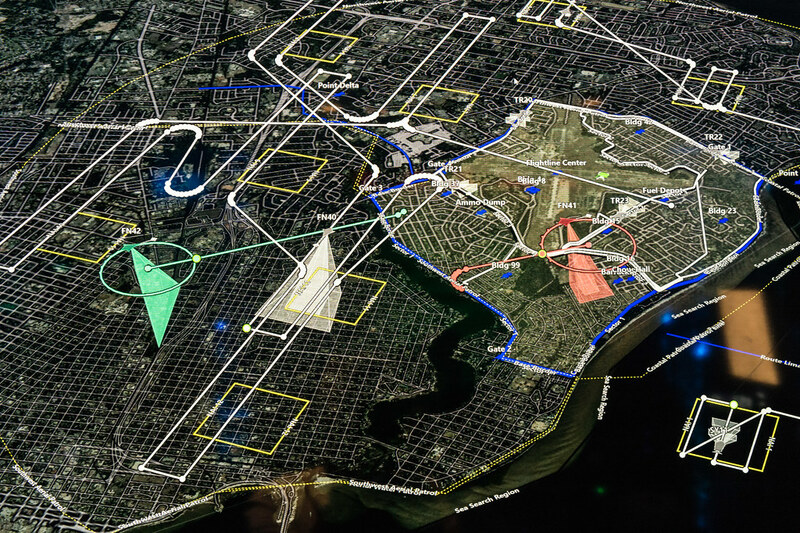 Much of the critical data is available real time and available to the pilot for immediate action. Each aircraft is slightly different as technology improves, but the amount of data that we’re able to download from a given flight is enormous. But hard data on the human weapon system is slim to none. This gets into right into some of the themes of Secretary of the Air Force has talked about going into artificial intelligence, big data analytics. How do we deal with all this data, make some sense of it and not run down the wrong path to get a wrong conclusion? I will tell you one area though, where we’re still struggling, not only the Air Force, but also the Navy and our colleagues at NASA, is collecting data from the actual human weapon system. We want to know things like pulse rate, oxygen content in the blood, cognitive functions, any anomalies with eyesight, but these are very hard things to sense independently without interfering with the aviators while they conduct their mission. 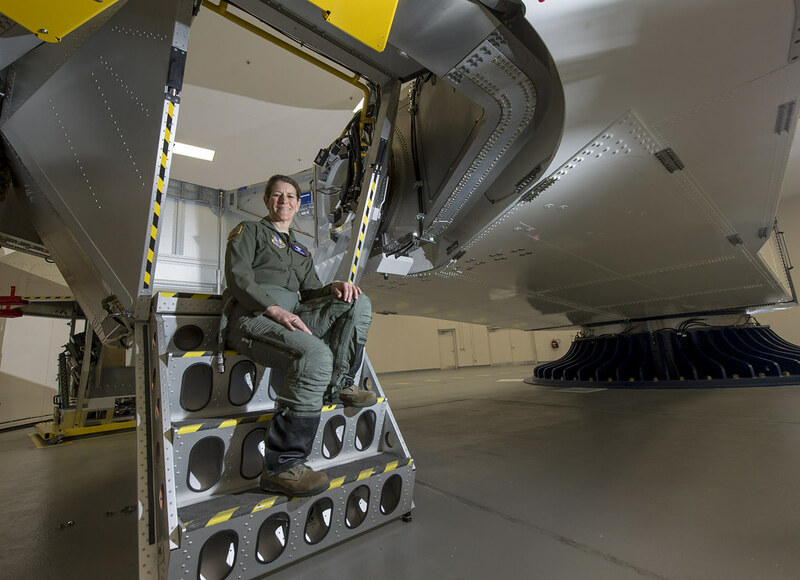 That’s a fascinating area of research that’s happening out at the 711th Human Performance Wing at Wright Patterson Air Force Base in conjunction with the Navy Medical Research Unit Dayton. 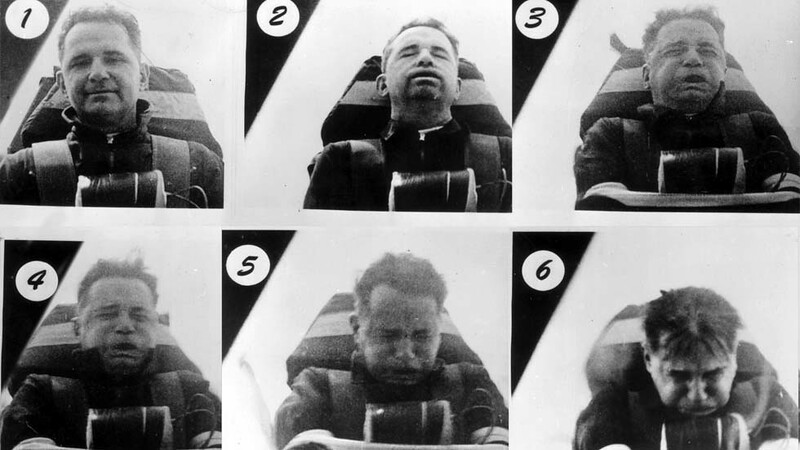 What they’ve started to do, both those labs working together and along with some NASA support, is fielding some prototypes, such as sensors that might go, for example, in the (oxygen) mask or on the pilot’s helmet. We actually know real-time information about the oxygen system in an airplane. We have sensors on the actual system to know the content of oxygen and other gases that might be presented to the aviator. What we don’t know is what happens in system losses; what happens between the actual oxygen production or the oxygen source and the pilot’s breathing. Furthermore, we don’t know the pilot’s ability to uptake that oxygen. There’s a lot of medical and physiological processes that we need to monitor better. A technique called Hybrid 3D Printing, developed by AFRL researchers in collaboration with the Wyss Institute at Harvard University, uses additive manufacturing to integrate soft, conductive inks with material substrates to create stretchable electronic devices. 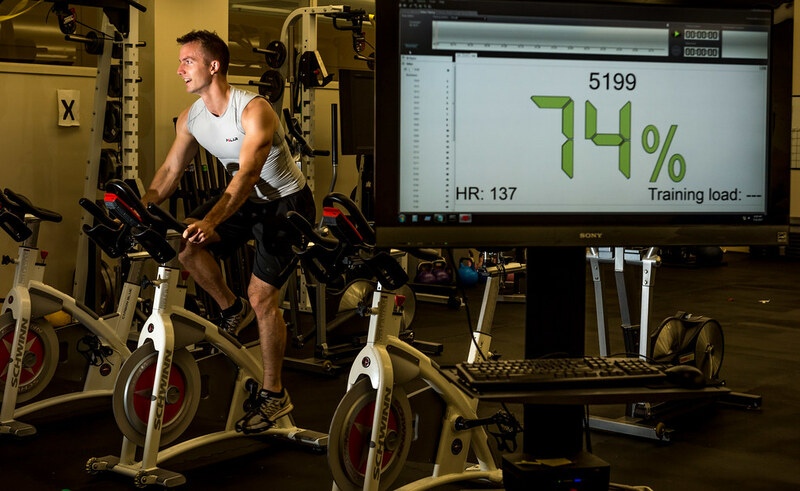 A potential application is to create sensors to enable better human performance monitoring. 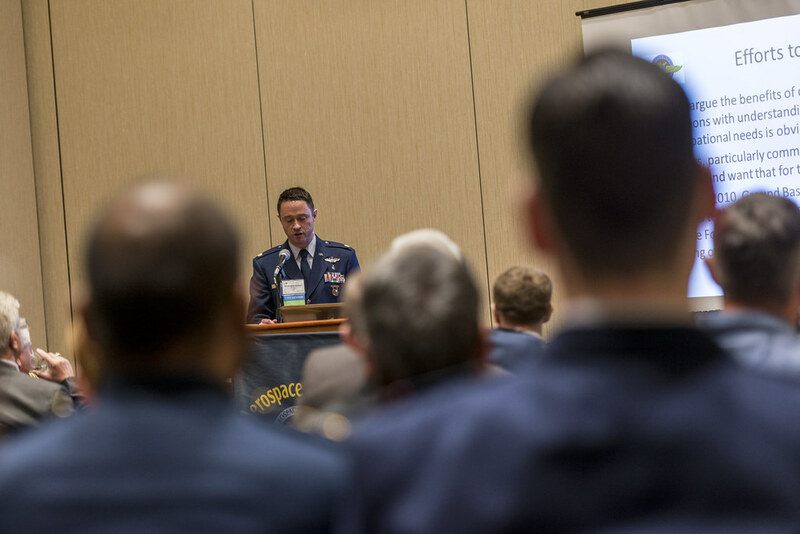 Airman Magazine: What does the end state of this research look like? 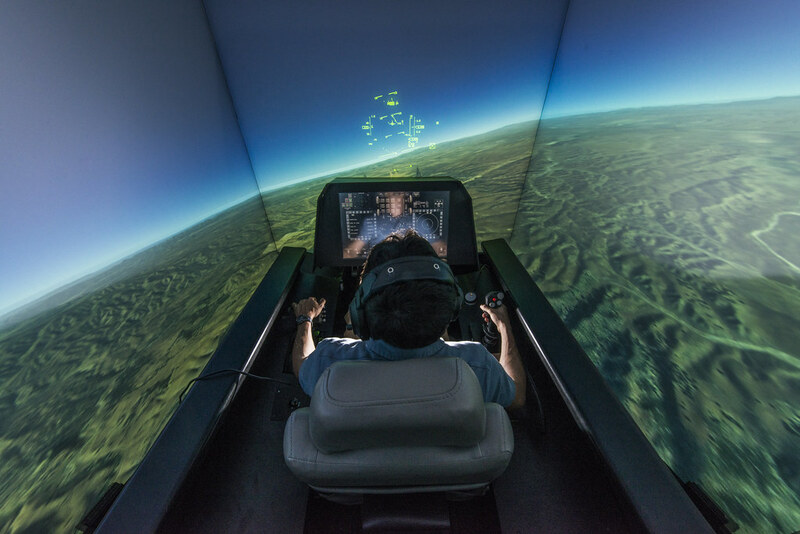 Are you talking about monitoring physiological responses of pilots during missions in real time? Brig. Gen. Vaughan: That’s absolutely correct. We’d like to get to an end state where the human weapon system is instrumented in such a way that’s noninvasive and nonintrusive. The aviators won’t feel the sensors and it doesn’t interfere with their duties at all, but that that data is available just like you would read all the instruments on an engine. We’re trying to figure out, is that five years from now, two years from now or 20 years from now? 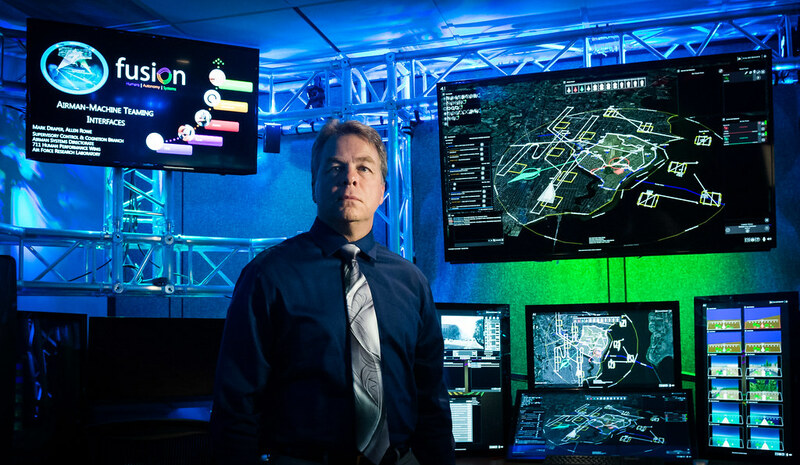 If you think of the human on the loop or in the loop going forward, especially in cyber systems and integrating across all-domain operations, it’s going to be more important than ever to make sure that the human weapon system is keeping up and that we’re able to monitor that. So we’re looking at sensors that might be wearable. A lot of folks out in the community are familiar with wearable fitness monitors and the chips that go in your shoes if you’re going to run a race to keep track of where you are. 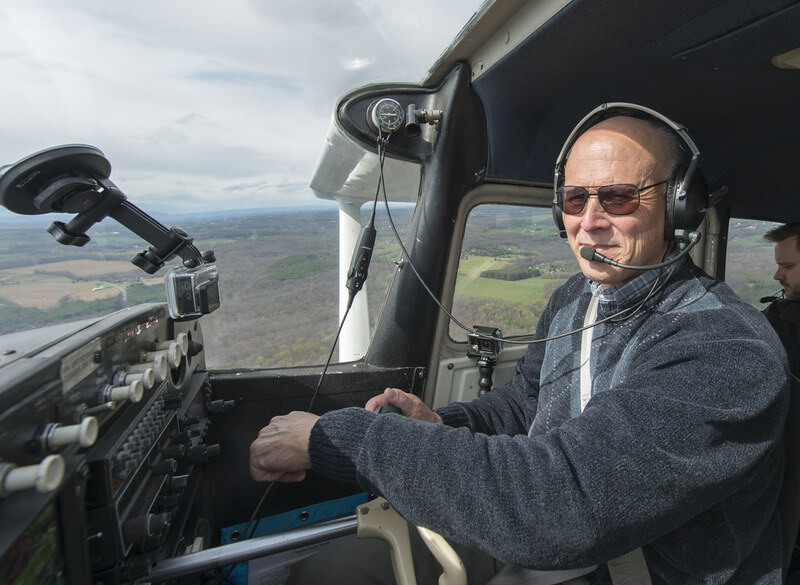 One of the challenges we have in aviation is the sensors that might be worn in commercial practice that people might buy at a local store are not suitable for the aviation environment, particularly tactical aviation. Not only do you have the pressure and temperature anomalies that occur as airplanes travel up and down, but in tactical aviation, fighters, bombers and training aircraft, there’s an awful lot of G-loading. There can be anomalies that go from high altitude to low altitude in very short order and that has a lot of wear and tear on the sensors. 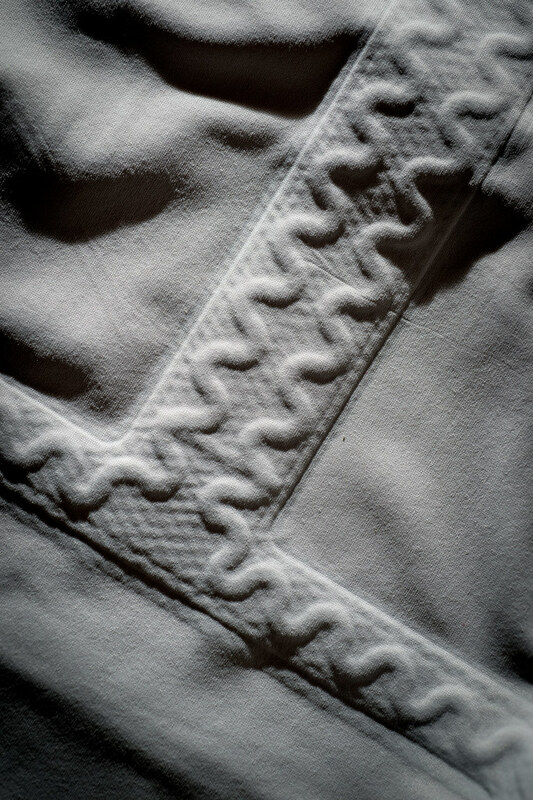 Some sensors are embedded in clothing and depend on contact with the skin. For example, in order to prepare themselves for a mission, aviators will strap down tighter than you might in an automobile to keep them safe, but that may also cause bulges in the clothing that interferes with sensory contact. There’s a lot of research yet to be done and a lot of development ahead of us. I’m looking forward to the Air Force potentially investing more in that research. I’m especially impressed with our ability to work with our joint partners with the Navy and the Army, which is coming on board later this month, in this PEAT effort. They’ve got a lot of exciting things happening in their aerospace medicine field and then NASA has been a partner throughout. You really can’t beat, from an intellectual capacity standpoint, having partners like the 711th Human Performance Wing and NASA. We’ve got the best partners in the world. 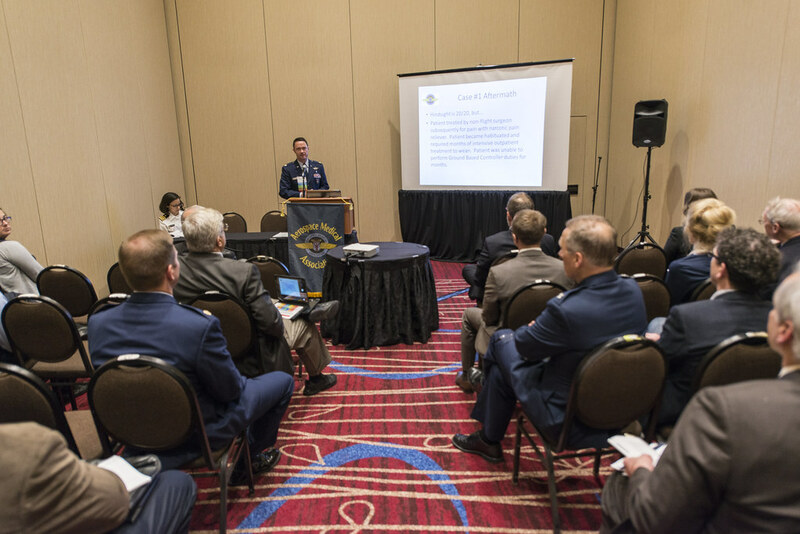 Airman Magazine: Are there other interagency or commercial partners in the research and investigation of PEs? Brig. Gen. Vaughan: Absolutely. Some of the companies that produce our aircraft have divisions dedicated to human physiology and enhancing the ability of the human to perform in or on the loop. They provide enhancements such as providing sensors and digital displays. In some cases, even an augmented reality display, which we have in many aircraft, where there’s a lens that comes over one eye and not only can you see your environment, but that lens will produce a heads-up display of images that will help you interpret what you’re seeing on the ground. Not only do we have industry partners that helping us with this, we also have universities and some international partners. Primarily we’re working through the Navy to access the folks that are doing that work on the outside, but we’re going to start working a little more with our international affairs group here in the Air Force to foster those partnerships. Airman Magazine: Do you see a time when human sensor capability will be baked in rather than bolted on? Brig. Gen. Vaughan: I think we’re going to get to that point. Right now, we’ve got to be sensitive to the fact, that if we start utilizing every sensor that’s available commercially, we run the risk of interfering with the mission and maybe causing a distraction. The last thing we want to do is have sensors be the cause of problems. We want the sensors to help us solve those problems. We’re looking at ways to prototype these things. Edwards Air Force Base, for example, where we do a lot of research and development flight testing, has been very instrumental in working with the 711th Human Performance Wing and the system program offices for the airplanes, to include the T-6, F-15, F-16 and others, in doing some remarkable testing that gives us great foundational data. That foundational data is important to determine where we do the development going forward. Also, we recently shook hands on an agreement with the Civil Air Patrol to help us collect, assess, and sort through the many commercially available wearable sensors. 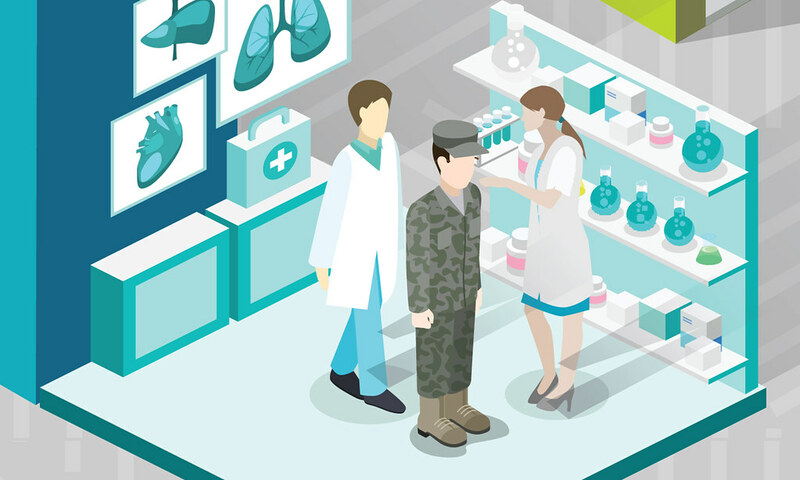 Airman Magazine: What’s the benefit to the force of being able to process and utilize PE data faster? Brig. 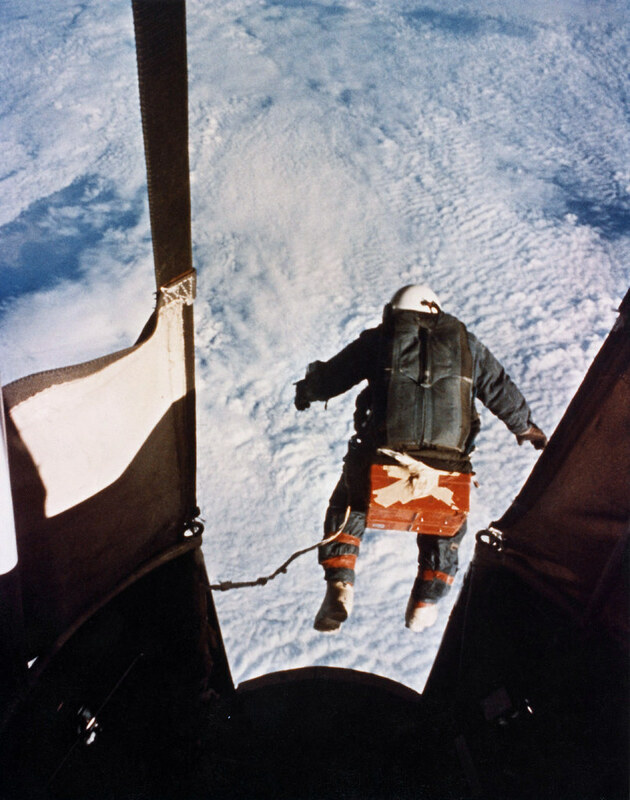 Gen. Vaughan: So for example, right now if we have a physiological event in the aircraft, we typically execute emergency procedures, get to a safe backup source of oxygen if it’s available, descend to an altitude where it’s safe to breathe ambient air and then land as soon as possible at the nearest suitable airfield. Perhaps what will happen in the future, with sensors on board, you may be able to head off that emergency. 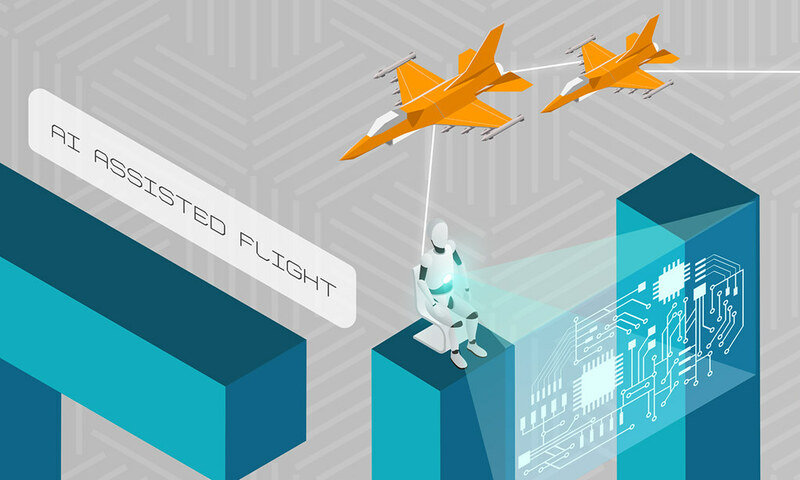 Sensors may alert the pilots to the fact that they are entering a phase of flight or a set of activities or an environment, where they’re at higher risk of these kinds of anomalies. By alerting the pilot to that, they may be able to mitigate it or avoid a physiological event. Furthermore, if there is a situation in flight, the sensors on board that gives them real time readings may enable them to do a better job of assessing what’s going on. But this is where it gets insidious. With physiological events, one serious possible symptom is an inability to assess the situation. Now that’s a pretty extreme symptom, but you may have those situations come up. In which case, presenting the data to the pilot as numbers or another traditional data format might not be as useful as, maybe, an alert light. There are some programs out there that cause the oxygen mask to vibrate a little bit. We do this with the control stick in airplanes as well. With such an equipped aircraft if you were to get into a stall, the control stick vibrates, They call it a stick shaker. Applying these proven technologies to other areas are all in prototype and being tested. 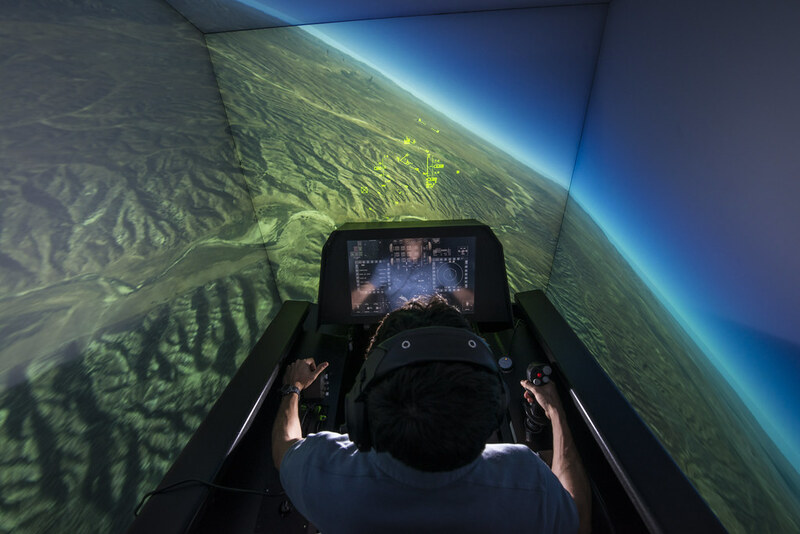 Zach Demers, an aerospace engineer, demonstrates the Automatic Ground Collision Avoidance System (Auto GCAS) in an F-16 flight simulator at the Air Force Research Laboratory, Wright-Patterson Air Force Base, Ohio, April 18. 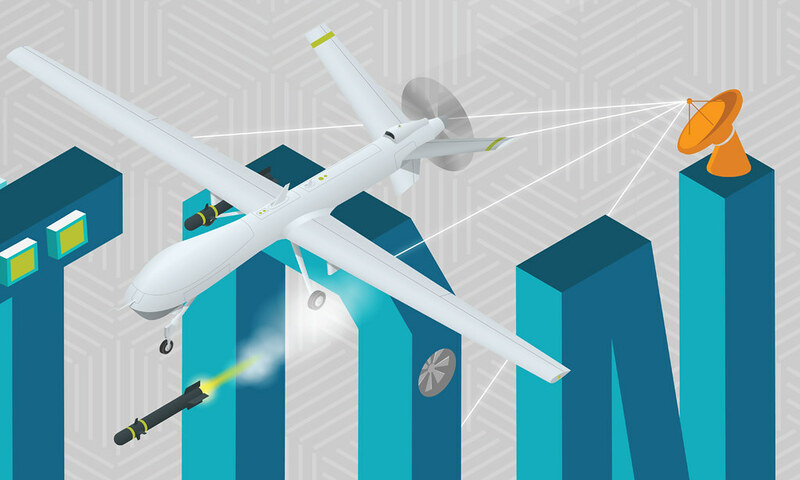 Auto GCAS, which constantly compares the aircraft's speed and position to a digital terrain map and will automatically take control if it detects an imminent ground collision, is credited with saving the lives of four pilots. Airman Magazine: Weren’t you involved in the adoption of another pilot safety system? Brig. Gen. Vaughan: Formerly, I served as the Air National Guard’s national director of safety. Part of our safety portfolio is flight safety and in that we have some advanced fourth and fifth- generation aircraft, but we also have legacy systems out there. Systems that don’t have baked-in ground collision avoidance systems. 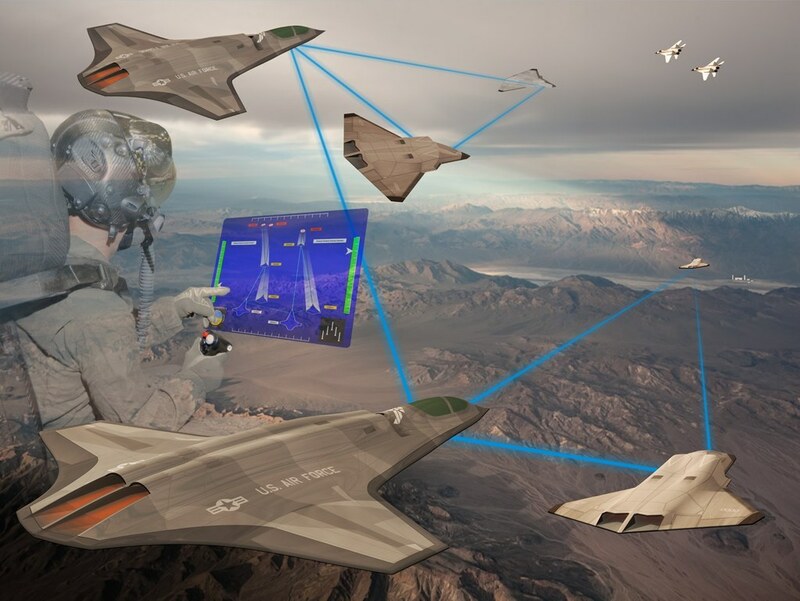 We worked very hard with the system program office and the Pilot Physician program in the United States Air Force to bring on board these Auto G-CAS systems (Automatic Ground Collision Avoidance System). We have confirmed saves in situations where the pilot may have lost awareness. It doesn’t have to be a physiological event. It can be task saturation or other things that cause the pilot to lose awareness of proximity to the ground. Traditional GCAS systems will alert the pilot, such as an X symbol in the heads-up display, letting them know they’re near the ground and need to pull back on the stick. In the Auto G-CAS, the aircraft sensors can actually determine the point where the pilot can no longer recover, due to the limits of human reaction time, and the system takes over the jet and recovers it for the pilot. As soon as the aircraft is in a safe regime, it returns the control back to the pilot. And that’s also had a couple of great saves for us. Airman Magazine: You mentioned the Pilot Physician program, what is that and are they involved in the J-PEAT and investigating of UPEs? Brig. Gen. Vaughan: Pilot Physician is a very unique program in the Air Force and its highly specialized. These are individuals are rated aviators of all sorts, but primarily pilots. Then they go to medical school and change their job category. 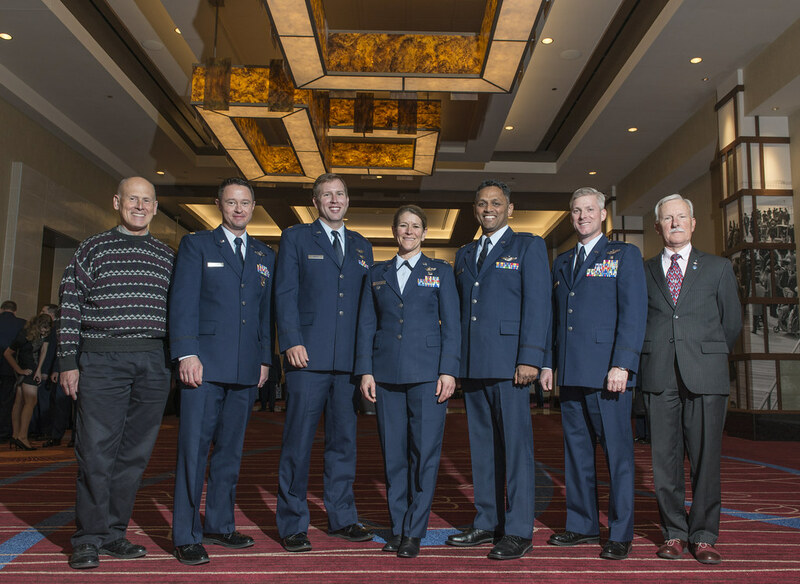 So they’re no longer primarily pilots for the Air Force, they’re now physicians for the Air Force. They’ve enabled to help us understand what’s going on both operationally and medically and where those two things meet. In other situations, you have pilots who were trying to describe what’s happening to them in the airplane and then you have medical doctors trying to understand that description. There can be things lost in translation between the communities. 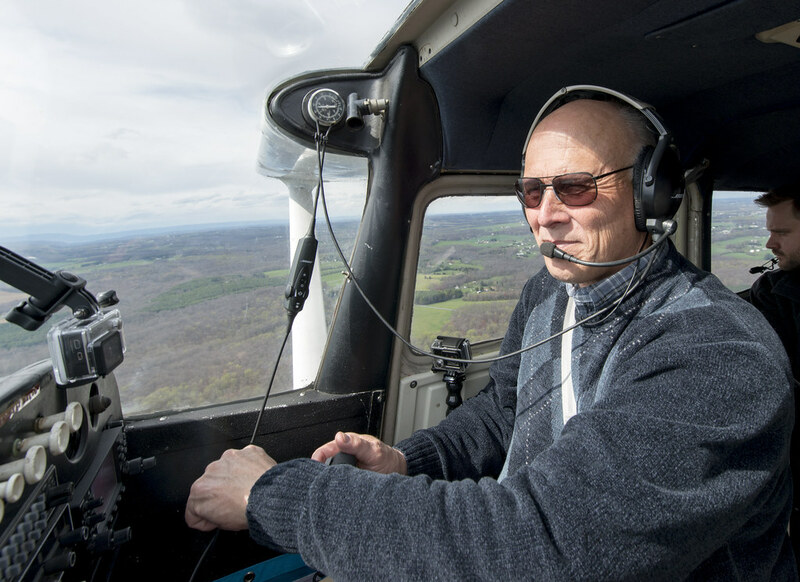 The Pilot Physicians speak both aviation and medicine fluently, are able to identify with the pilots and, in many cases, have flown that exact aircraft being investigated. Lt. Col. Jay Flottmann, pilot physician and 325th Fighter Wing chief of flight safety, explains how a valve in the upper pressure garment and the shape and the size of oxygen delivery hoses and connection points contributed to previously unexplained physiological issues during F-22 flights. Airman Magazine: Are there specific examples of investigations that benefitted from Pilot Physician experience and expertise? Brig. Gen. Vaughan: Lt. Col. James “Bones” Flottman was the Pilot Physician directly involved in the F-22 investigation that we did a few years ago. 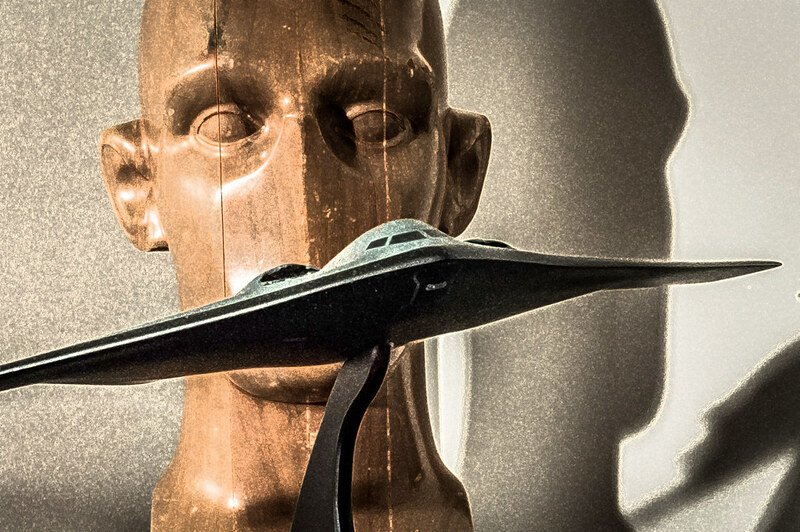 The F-22 had a series of physiological episodes. He was the one that was able, as an F-22 pilot and a physician, to credibly determine that it was a work of breathing issue. It was a combination of factors, we don’t need to go into all the specifics right here, but he was able to bridge the gap between pilot practices, things they’ve been taught to do and things they did through experience, and what was happening medically. That resulted in improvements in the whole system – improvements in some of the hardware and improvements in the pilot practices. Not only was he able to help the investigation team solve that, he was able to then go back and credibly relate this to the pilots, restoring faith both in the system, in the Air Force process. There’s another one that is a friend of mine, retired Col. Peter Mapes. 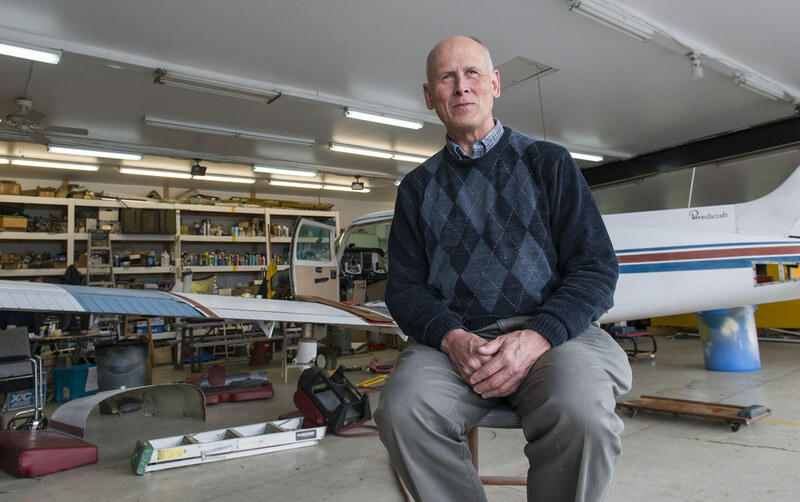 Dr. Pete Mapes is a classic Pilot Physician. He was a B-52 pilot and a fantastic doctor, as are all of them. He and I worked closely together on Auto G-CAS, as well as several key people in engineering and operations. He was really the driving force, along with Lt. Col. Kevin Price, at the Air Force and the OSD level to push that development and production through, especially for the legacy aircraft. He also had a role in many other aviation safety improvements to include helicopters, specifically wire detection. A lot of helicopters have mishaps because they strike power lines. He was instrumental in getting some of those systems put into helicopters and out into the fleet. He was also instrumental in improving some of the seat designs and some of the pilot-aircraft interface designs as well. Really too many to mention. Another great a success story for the Air Force, when it comes to the Pilot Physician program is Col. Kathy Hughes, call sign “Fog”. 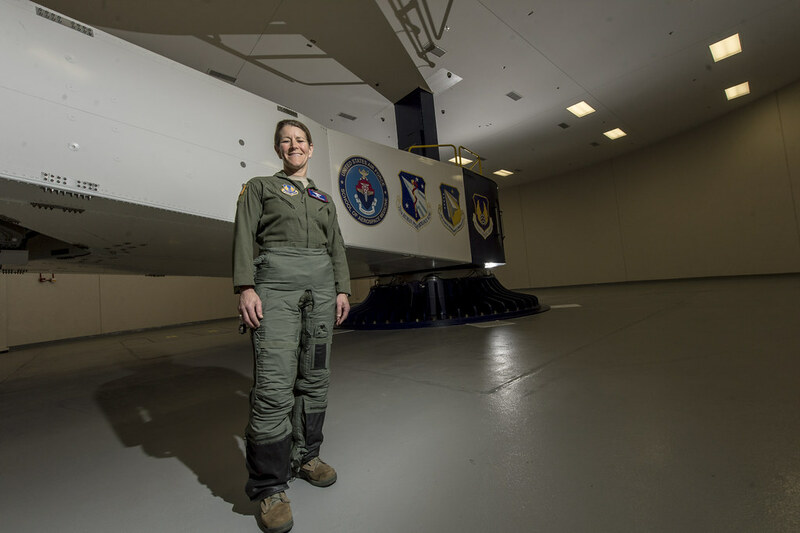 She’s flown the T-38 and A-10, a great flying background, and has been a wonderful physician for the Air Force. 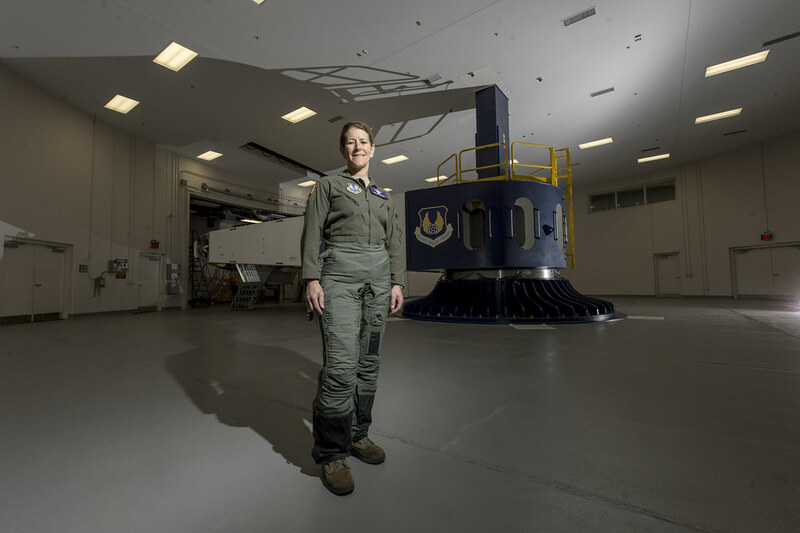 She really explored the use, the application and the design of our G-suits and was able to help the Air Force evolve into a full coverage G-suit. So now the G-suits that our fighter aviators fly are more standardized and more effective than the previous generations of flight suits. Thanks, in large part, to her work. I recently met her at aviation safety conference where she is helping commercial interests design better ejection seats. That’s just three examples. There’s a whole laundry list. We also have advising both the Navy and Air Force PEAT, Col. William P. Mueller; call sign “Ferris”. Col. Mueller was an F-4 fighter pilot and now one of the top physicians in aerospace medicine. He’s been absolutely invaluable in helping us understand what’s going on with the physiological episodes. He not only sits on the Air Force PEAT, but he also has a permanent membership sitting on the Navy’s PEAT. So he’s part of that joint interaction and offers a fearless perspective on improving training. 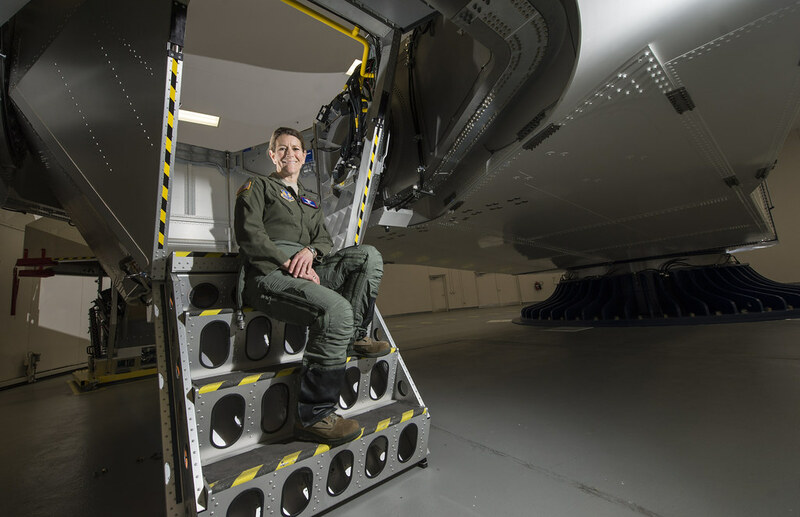 Col. Kathryn Hughes, a pilot-physician and director, Human Systems Integration, 711th Human Performance Wing, sits on the stairs of a centrifuge at Wright-Patterson Air Force Base, Ohio, April 22, 2016. 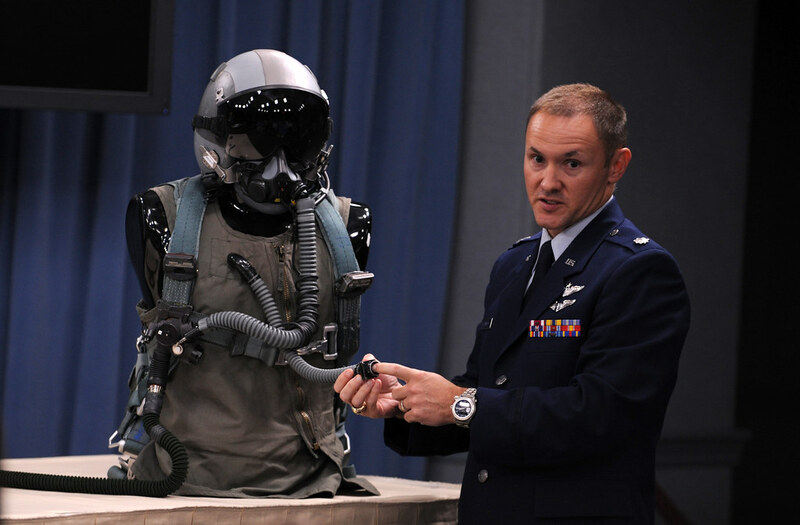 Hughes, an A-10 Thunderbolt II pilot, was instrumental in the integration of the full-coverage G-suit into the Air Force inventory. 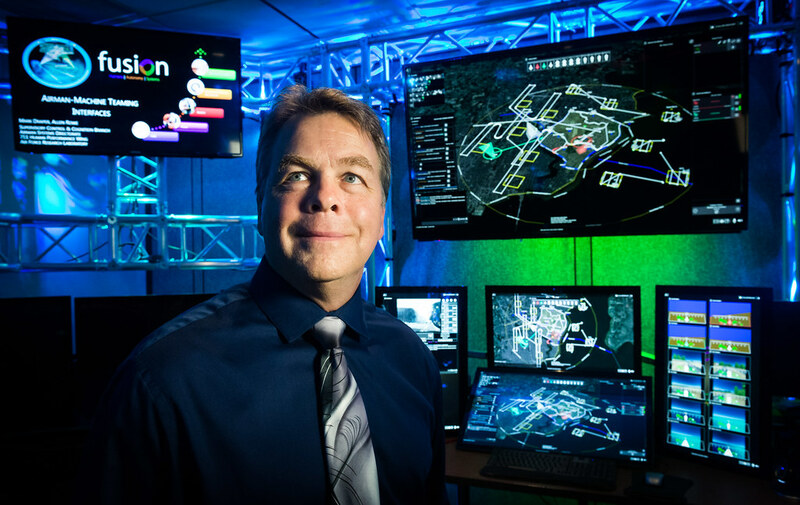 Airman Magazine: Could research into making Big Data more easily utilized by the warfighter have an application in investigating and mitigating PEs? Brig. Gen. Vaughan: I like using the email analogy. So most of us have email. Those that work in an office may have one for work and one for personal use, or maybe even more than that. If you’re like me at all, if you skip checking your emails for even one day, you find yourself in a huge email deficit. 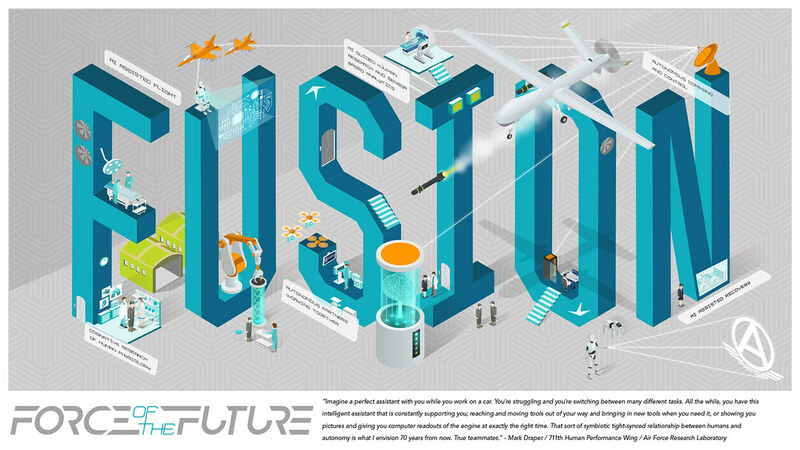 Now imagine all the sensors, whether it’s a cyber system, aircraft systems, space system, and each piece of all the data being collected as an email coming to you. Within minutes you would be completely overwhelmed with data. So we’re going to rely on systems to help us sort through the data and present those things that are most important now for decision making. Those other pieces of information that we might want later for analysis, it will store those and present them at the appropriate time. So that gets after artificial intelligence. We need these systems to work with the human in the loop. We don’t necessarily want it to be standalone. We want it to be integrated with humans and that’s where the real challenge comes in, because as an aviator flying an airplane, the data I want right at that moment to prosecute the fight, may be different than the data a cyber operator working with me in that operation may need at that same moment. Artificial Intelligence or underlying data systems will have to be smart enough to give the data to the operator that’s needed to make the right decision. I recently spent some time with Satya Nadella, CEO of Microsoft. I asked him about this wicked technology problem of applying artificial intelligence on the tactical edge. His advice about leveraging cloud technology to perform advanced operations on big data, where and when needed, has been invaluable. 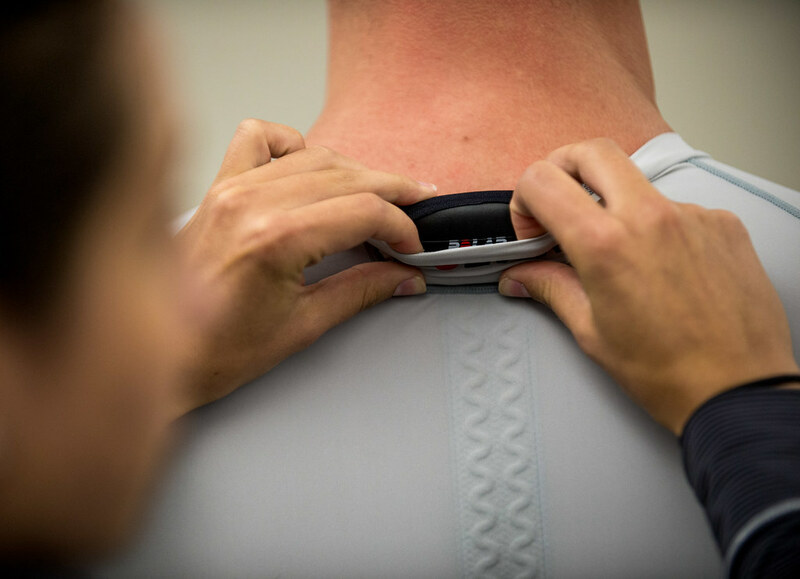 Airman Magazine: How does recorded data on individual pilots allow you establish baseline physiology and find relationships between PEs that may occur in aircrew from different units and bases? Brig. 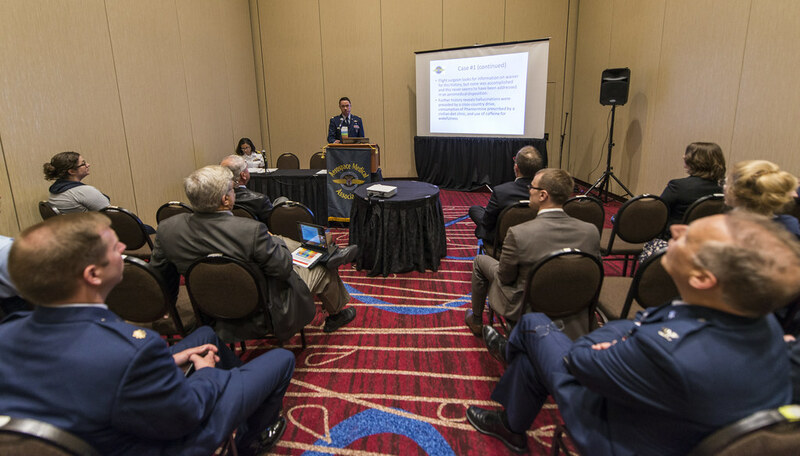 Gen. Vaughan: We’re already finding benefit from that data, so the 711th Human Performance Wing is working very closely, in this case with the T-6 system program office, and some big data analytic gurus. These folks will take large volumes of data and slice and dice it to find where there might be some differences from what would be considered a baseline or normal. Then they can dig into those differences and see if there is something to learn. They’re finding a lot of great results that help us improve the systems. Because physiological events involve humans and each human has such a different reaction and an individual person will have a different reaction on a different day, it can be difficult to look at a small sample size and draw any big lessons. We need large sample sizes and that’s where you can start to kind of tease out the pieces of the data that are going to move us forward. As we worked with the Navy on the Physiological Episode Action Team we have found that pilots in the Air Force and the Navy are more informed than ever. They know people in the tech business and the pilots talk amongst themselves and share information and they’re finding these wearable sensors. Most of the wearable sensors are not suitable for aviation use. They just can’t provide good data under those conditions, but it’s worth exploring. Talking to Admiral Luckman, we wanted to find a way to get these sensors, and most of them are small things like fitness monitors, that just aren’t allowed in our environment right now, into the cockpit just to see how they survive a flight. The Civil Air Patrol, which flies general aviation aircraft, fly with their smart phones and other types of equipment. They have a tremendous safety record, but they also have a completely different set of rules than we do. They typically just follow the AIM and the FAA civilian flight rules. Most of those flight rules don’t have any prohibitions on bringing equipment in your pocket or your flight bag. 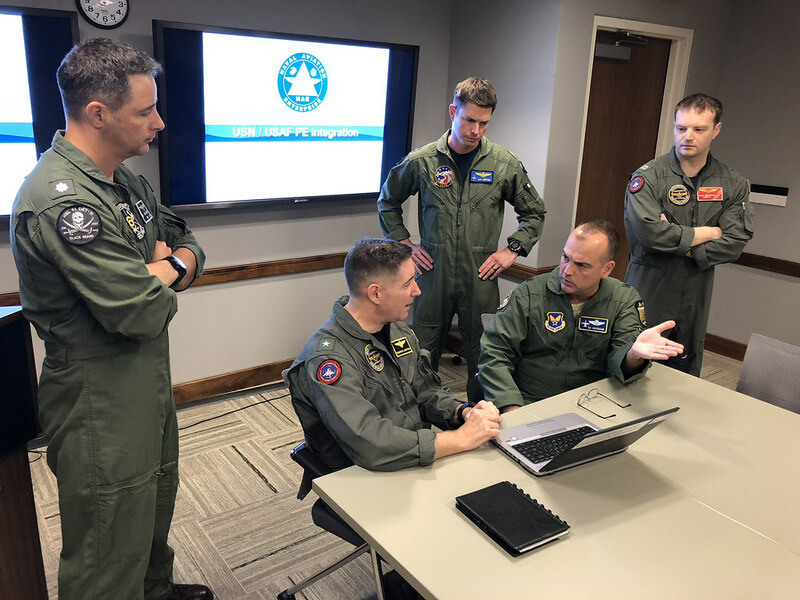 So recently we sat down with some of the leaders of the Civil Air Patrol to work out a memorandum of understanding whereabouts we’ll get these ideas and sensors to our pilots in the fleet. Some of them will appropriately go through Air Force and Navy channels and may end up being something of a program of record in the long term. Others that we can’t cross that gap and into the system, we’ll offer those to Civil Air Patrol and, at their option, they can start flying those. It’s not official flight test, but they can at least tell us, does this thing survive a flight up to 10,000 feet and back. And that piece of information might be just enough. 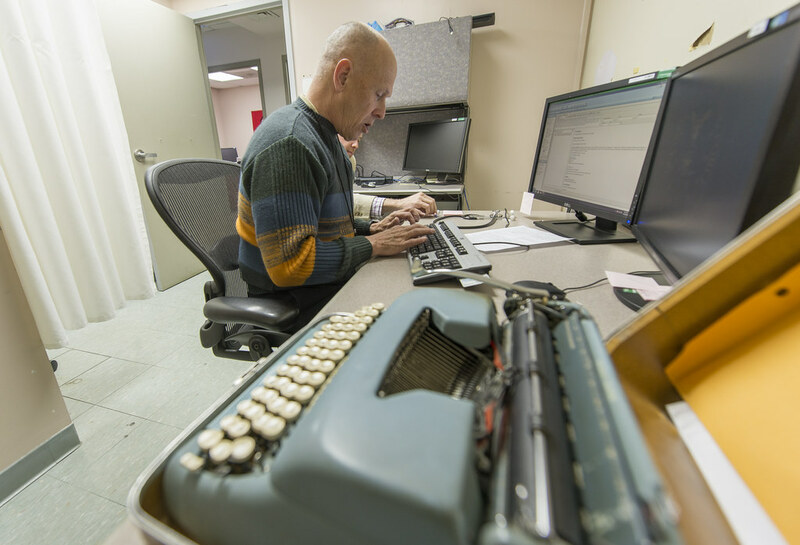 That then allows our system program office with the labs to start taking a closer look. Airman Magazine: This may seem like an odd question, but do PEs occur within the RPA or cyber communities where the ops tempo is so extreme? Brig. Gen. Vaughan: So that’s a great question and that’s why I think the development of sensors and better understanding of baseline human physiology is so important. The RPA environment is just the tip of the iceberg. 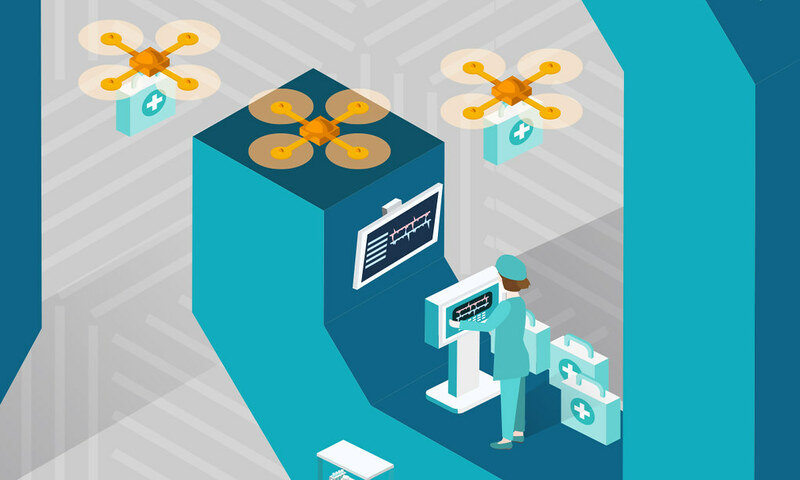 As we look at humans in the loop or on the loop, human physiology, whether it’s in cyber, RPAs, intel, space, any of the other missions that we’re doing, is a very important consideration. What we don’t have yet is a tremendous amount of baseline data. What’s physiology supposed to look like in those situations? So when it’s different, how would we know it? That’s some of the work that’s going on right now at the labs is base-lining that data. I will tell you that while the environment of RPAs is uniquely different than the environment in airplanes, but it’s not always easier. You have a lot of folks that are out there engaged in very serious operations, life and death situations, that they are dealing with for hours on end and then go home every night to their families and to would be a normal environment. Most people have coping mechanisms to deal with that. But that’s one of the areas of research that folks are looking at in the labs – how do we better prepare people to go back and forth between these kinds of environments? 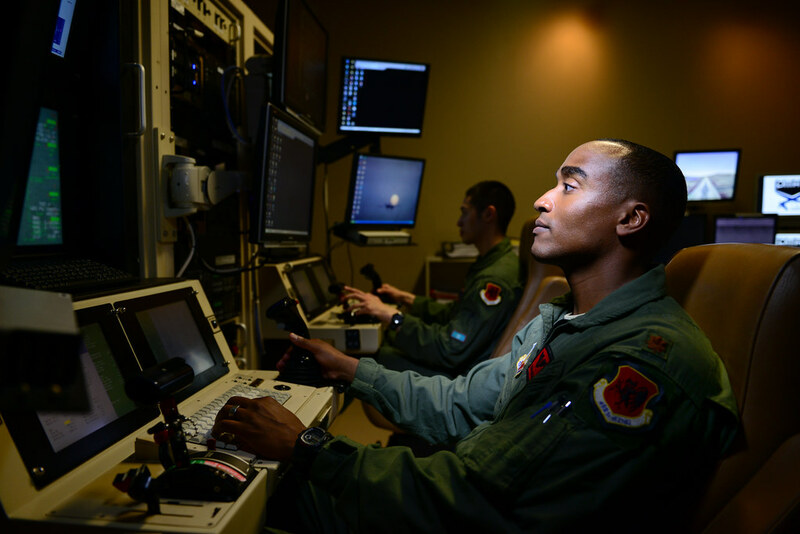 Maj. Bishane, an MQ-9 Reaper pilot, controls an aircraft from Creech Air Force Base, Nevada. 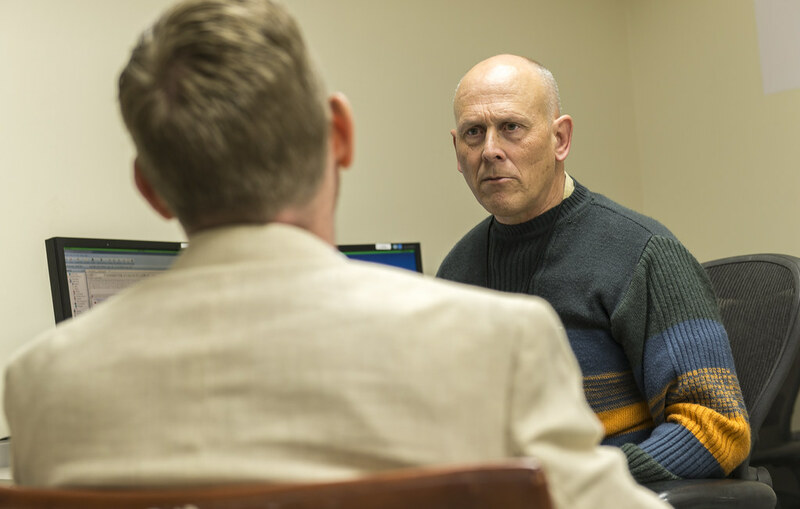 RPA personnel deal with the stressors of a deployed military service member while trying to maintain the normalcy of a day-to-day life. 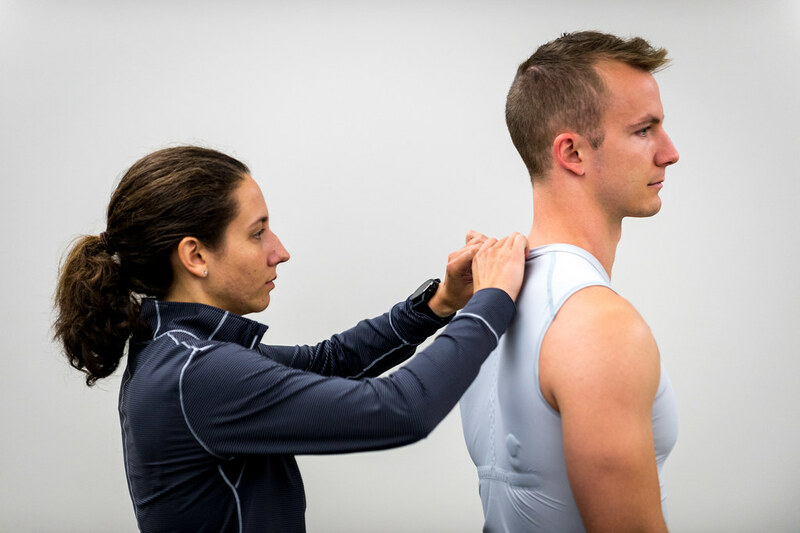 In the future, sensors may gather baseline physiological data on RPA crews to help maintain their health and readiness. Airman Magazine: Let’s shift gears and talk about your career history. How does leading PEAT differ from your past experiences as a safety officer at a wing or a squadron? Brig. Gen. Vaughan: Prior to this, I worked for Secretary Mattis in OSD reserve integration. We basically informed OSD policy relative to the seven different reserve components out there to include the Air National Guard. Before that, I served as commander of the 156th Airlift Wing. As a wing commander, it is a minute-by-minute duty to make risk decisions and it’s very important to realize the consequences of those decisions and understand that whole risk matrix. In my current position, I’m not a commander of anything. I’m not really in charge of folks specifically. We have a team, but we come together as required. So this job is more informative. One of our primary roles is to inform commanders. As they give us data, we give them back context so they can make better risk decisions. 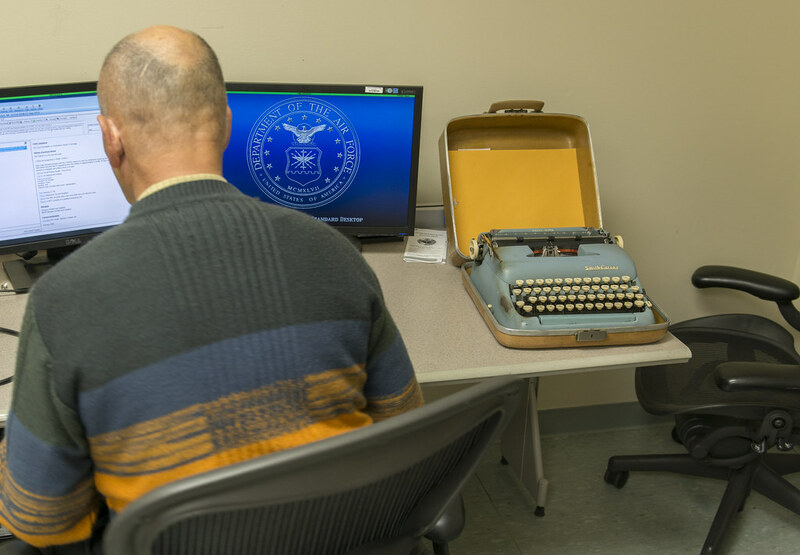 It also allows the labs to put a focus on their studies enabling the system program offices to acquire and improve systems to support the mission. So this job is very different in that respect. I think having been a commander previously helps me understand what these commanders they need to hear and how they want to receive that data so it doesn’t overwhelm them. Airman Magazine: What is it you would like the pilots and aircrew to know about you, the PEAT and their part in preventing and mitigating PEs? Brig. Gen. Vaughan: I traveled to Randolph Air Force Base and I had the opportunity to meet with some of the higher headquarters staff. I met with the commander of 19th Air Force and I was very encouraged and reassured with everyone’s openness to really solving this problem as aggressively and quickly as possible, talking about physiological episodes, but also, in a broader sense, the sustainment of the T-6 and sustainment of other airframes for which people might be interested. I feel good about where that’s going. I also had a real eye-opener when I had an opportunity to meet with some of the T-6 pilots. We met off base. We decided to meet in a restaurant in a casual environment. We wanted that format because I wanted to hear really unfiltered what some of these T-6 pilots, who are some of the most experienced pilots in the Air Force flying that mission, that airframe. I was able to learn a lot. They have great faith in their chain of command and leadership. They have valid and serious concerns about physiological episodes, as does the commander all the way up to the chief of staff and the Secretary. 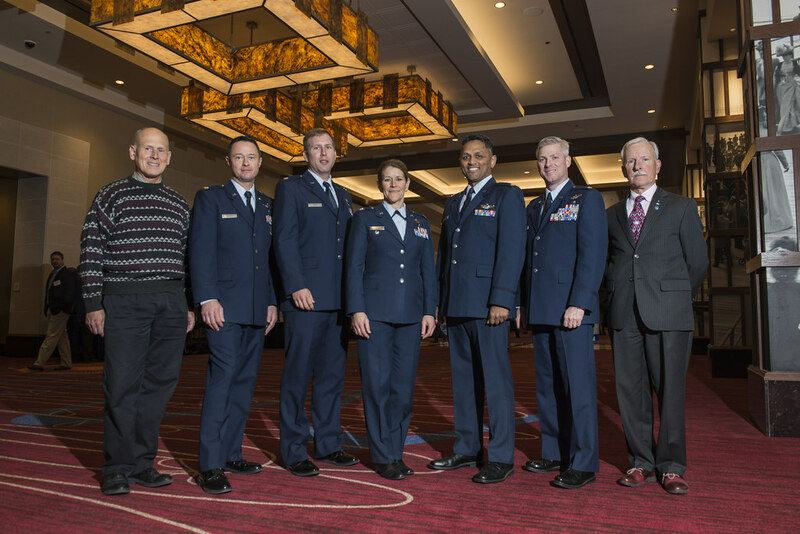 I think being able to hear their perspective, share with them my firsthand knowledge of meeting with senior level commanders in the Air Force bridged some gaps. I also was able to hear some very specific engineering questions and connect some of those pilots directly with some of the engineers at the system program office and some folks within their own chain of command that they just haven’t connected with yet. Just trying to get those dialogues going, because the solutions that the air Force is putting into place, whether it’s T-6 or any other airframe, are usually phased. Some of them require major investment, money and time-wise, and those take a little longer to accomplish. So how do you bridge the gap between today and when we get to that promised land if some of those bigger fixes and it comes down to some solid risk management? In the case of the T-6, there’s a whole list of maintenance protocols that we handle and emergency procedures for the pilots that don’t necessarily reduce the number of these events, but they can reduce the severity and certainly mitigate the consequences. That’s what we’re trying to do. We don’t want a situation where any physiological episode goes far enough to lead to a permanent injury or harm of an aviator destruction of property. We want to catch those things as early as possible through these mitigation techniques. Another thing I got to do when I was at Randolph was shadow the maintainers as they did maintenance on a T-6 that had a physiological episode. In the past, when these things would happen, there wasn’t a specific protocol. They would do their very best to look at the oxygen system, but there wasn’t a protocol on how to do that. T-6 Texans fly in formation over Laughlin AFB, TX. Over the last year, with the help of a lot of the pilots, doctors, chain of command folks, human performance wing – a big team effort, when the airplane lands after one of those instances it’s an automatic protocol for that oxygen system. In most cases it’s removed and a new one is put in and the suspect system then gets this thorough going over at the depot level and not only do we fix that, that particular system and return it to service. We’re able to learn a lot and collect data points. In some cases, we don’t find the specific cause in that system and then we look elsewhere – maybe more pilot interviews, talking to the doctors and trying to piece it together. The protocols that are out there now not only helped mitigate the consequences of these events until we field new equipment, but they also help us in collecting data that will inform better decisions going forward. 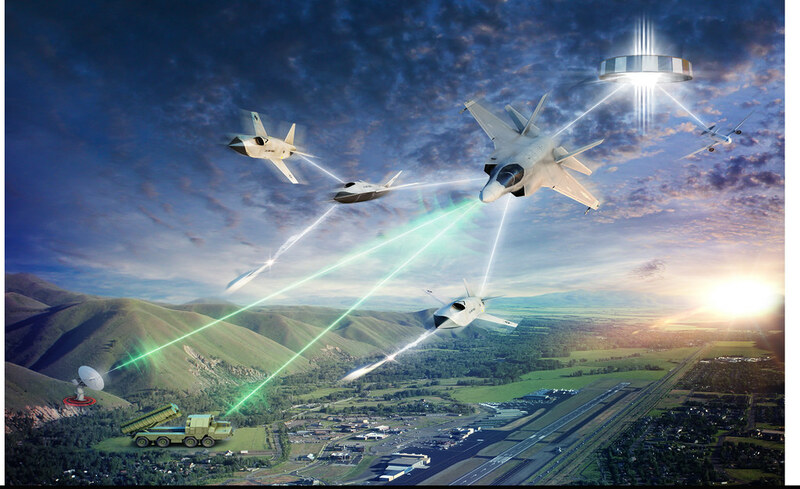  Archived in Command Interviews, F-22 Raptor, F-35A Lightning II, Medicine, Operational, Research & Technology, T-6, Training and tagged AFRL, Air Force, Air Force Research Laboratory, air force technology, Air National Guard, airman, airman magazine, Army, F-22, F-35, innovation, J-PEAT, leadership, medicine, Navy, PEAT, pilot physicians, pilots, research, technology, training, UPE, Wright-Patterson Air Force Base. Bookmark the permalink.